and repeating these again and again, being greatly distressed since emperumAn neither felt compassionate and blessed her nor he appeared and said “this is not apt” and condemned her; because of this she decided to finish herself but then realising emperumAn’s yOga nidhrA (meditation in milky ocean) where he resides thinking about the protection of the universe, and thinks “such emperumAn will not disregard seeing my distressed state” and survives. Meditating upon these aspects, AzhwAr thinks “ISvara with such nature, is not coming to protect this AthmA (me) in this situation; what is the method to protect this AthmA [I] which is totally dependent on emperumAn that I cannot even kill myself?”; in this manner, AzhwAr explains his calling out, being unable to bear the delay, in the mood of a beloved woman (parAnguSa nAyaki) who is suffering in separation in the lengthy night time from his beloved man who is supreme lord himself. 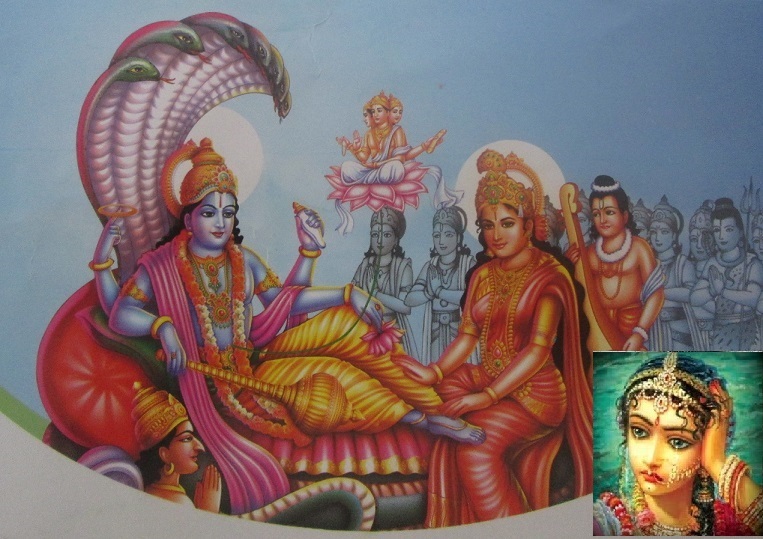 Previously – it went along with great urge for parAnguSa nAyaki where she said “nAdum iraikkavE – yAmadalUrndhum“; but she lost all her strength [as time passed by] and engaging in madal became as difficult as attaining him; now, when one engages in madal, the picture of his/her beloved person should be drawn on the cloth; either emperumAn hid the sun as said in periyAzhwAr thirumozhi 4.1.8 “AzhikoNdu aniRiravi maRaippa” (hiding the sun with his sudharSana chakra, back then) or by divine arrangement, the sun set and the night arrived [making it difficult to draw] and it is not just the evening time but midnight when everything is fast asleep; as everyone irrespective of those who blame or those who give favourable advise to withdraw her from him, were sleeping and she was alone; at that time, she started meditating upon the qualities of purushOththama, who is the protector of all, and is of the nature of helping during total deluge; but such meditation during separation causes more anguish and she starts thinking to hang herself with the help of her own hair to kill herself and be saved [by giving up her life, she no longer needs to undergo the pain of separation]. [Is there anyone who tried to commit suicide like this in separation? sIthAp pirAtti’s example is highlighted from SrI rAmAyaNam sundhara kANdam 28.25] vishaysa dhAthA – Will we find any more generous person who will give this best material [here, poison is considered good because it will help end her life]? mE – Even if such generous person is there would he give it [and end my agony]? SasthrasyavA – Or is there any one who can give me a weapon that will finish me quickly unlike poison which may take some time to finish me? vEsmani rAkshasasya – In this town where rAvaNa kills me every day by keeping me separated from SrI rAma, is there anyone who will give me the tool for my mercy killing? As parAnguSa nAyaki becomes desirous of killing herself, emperumAn reminds her “Since I am sarvarakshaka (protector of all), I have descended to thiruppARkadal (divine milky ocean) for the protection of all and have set to out to protect you, and you appear to be running out of patience”; she then thinks “as he is protector of all, he is destined to protect me, and it is I who am becoming impatient; should my protection naturally happen?” and having realised about his qualities, she sustains herself. This entry was posted in thiruvAimozhi, thiruvAimozhi 5th centum on June 25, 2017 by Sarathy Thothathri.